From the East on I-80 in Iowa, take I-29 South to exit # 35 A-B Hwy 34 West. After crossing the Missouri River bridge into Nebraska, take the first right (less than a quarter mile from the bridge) turning North onto the Harlan-Lewis road. Travel 2.5 miles and turn right into the Base Lake Recreation area. After crossing the railroad tracks, follow the road to the right around the lake to the FamCamp check-in which is also the boathouse. ---- From the West on I-80 in Nebraska, take Hwy 75 South. 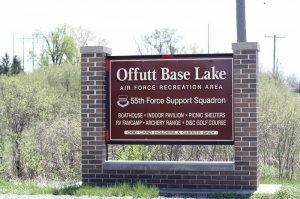 Hwy 75 will take you past the Offutt AFB entrances, do NOT go onto the base; the FamCamp is located outside the base proper. Continue on Hwy 75 South and turn left onto Hwy 34 East. Travel less than 2 miles and turn North (left) onto the Harlan-Lewis road; this turn is less than a quarter mile from the Missouri River bridge and is the last turn before crossing into Iowa. Travel 2.5 miles and turn right into the Base Lake Recreation area. After crossing the railroad tracks, follow the road to the right around the lake to the FamCamp check-in which is also the boathouse. Open year round with water service limited to a central fill-up point during the winter. Advance reservations are accepted from mid April to mid October by calling (402) 294-2108. Reservations can be made up to 30-days in advance with non-refundable first night&#039;s payment and are held through 6PM the first day of your stay unless approved for late arrival. Active duty reservations for holiday weekends accepted 45-days in advance. Off-season the FamCamp is first come first serve with on-site self-registration. Initial reservation is limited to 30 days. One 30 day extension may be requested upon arrival but is considered on a case by case basis. Reservations for sponsored guests may be made 14-days in advance and are limited to 7-days. Sponsored guests are unauthorized between Memorial Day and the 4th of July weekend or during Labor Day weekend. No more than one guest may be sponsored at a time. Free WIFI. Wireless is available throughout the FamCamp and a customer computer is available in the Cast-A-Ways Boathouse in season. Higher rates are for sponsored guests. 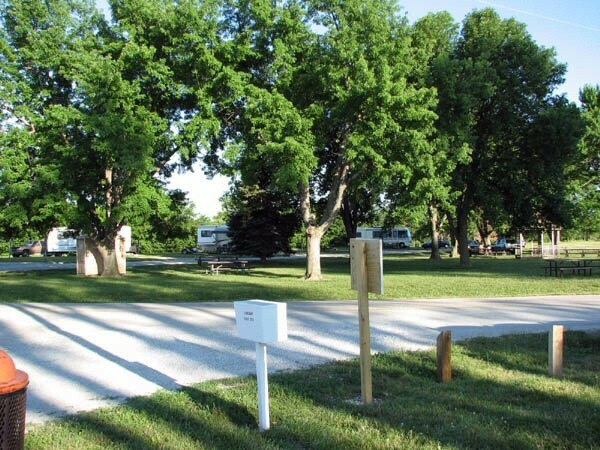 The Offutt AFB Base Lake Recreation Area features 40 full service hook-ups with concrete pads, water, sewer and 50 amp electric services. 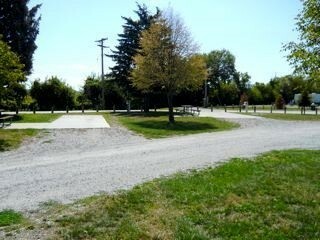 There are also 6 dry/overflow sites with gravel pads and picnic tables only. Check-in is at noon, check out is 11am. Quiet hours are 10 PM -6AM. Tent campers must check in and register at the Cast-A-Ways Boathouse or after hours with the Famcamp Host located in Site 20. The Cast-A-Ways staff can provide a map of the authorized tent camping locations. 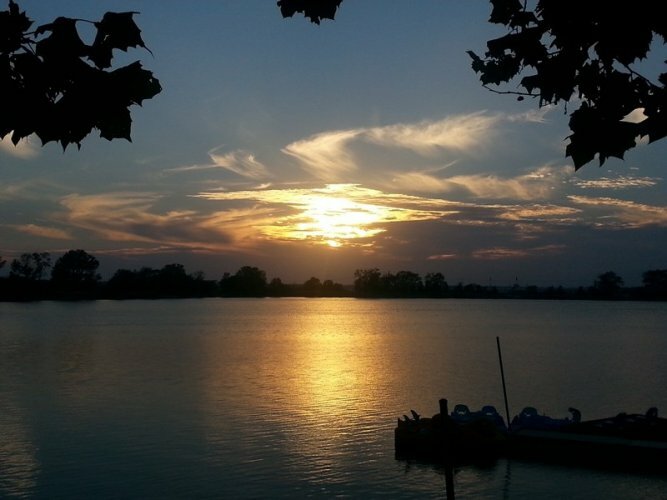 The Base Lake consists of 113 acre lake is stocked with largemouth and smallmouth bass, walleye, wipers, crappie, redear sunfish and catfish and also contains bluegill, drum, gar, carp and several other species. Wading, ice fishing, bow and spear fishing are prohibited. Overnight fishing is permitted with NE and Base Lake permits. 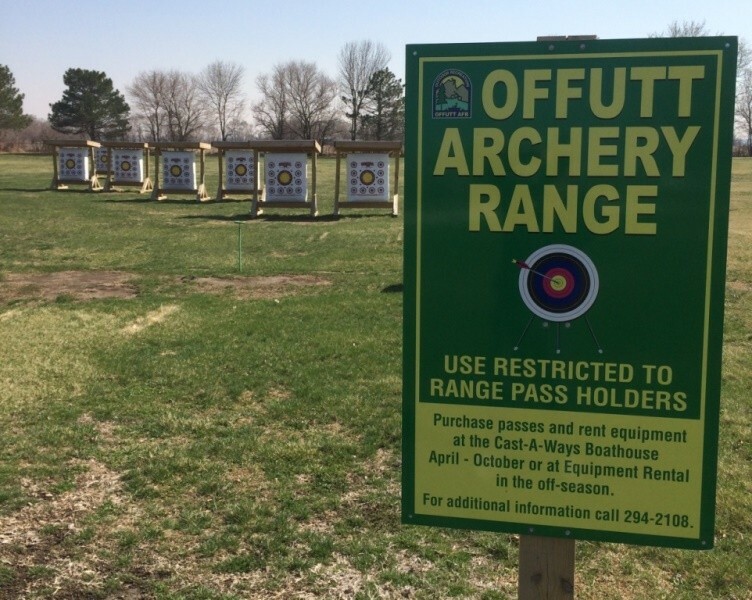 Facilities include a large indoor pavilion, 4 covered shelters, soccer field, archery range, basketball court, horseshoe pits, an accessible park, sand volleyball court, disc golf, sports field. This is a heads up...have interests in the Omaha area, and received overheads of the Offutt AFB. 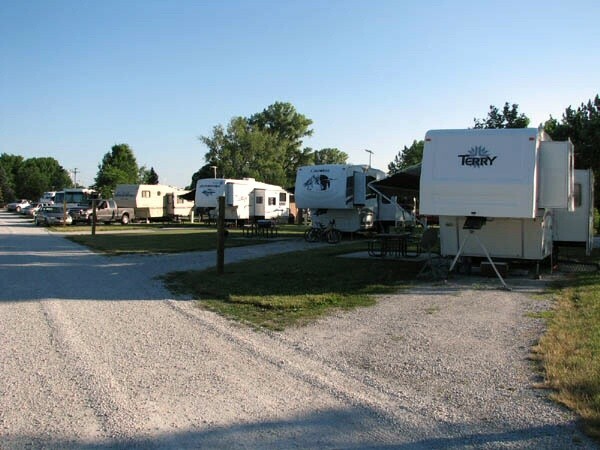 The campground and all facilities are covered with water/flooded. Judging from the pictures and having stayed there a number of times, I’d estimate by at least five feet of water as the road in is not identifiable and it is above the base lake, which is barely identifiable. Only the tree line on the entry road can be seen. My guess will be months to repair. As the red building that takes reservations is flooded, it may be a while before they are answering the phones. 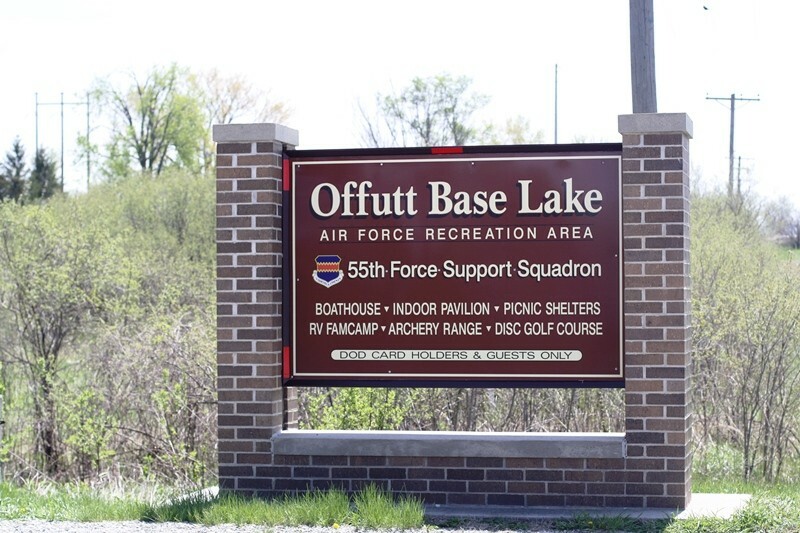 Offutt Air Force Base is preparing for flooding as the Base Lake and FAM Camp areas are under an evacuation order, according to a press release from Offutt's public affair's office. Base personnel are "taking necessary precautions to minimize damage in anticipation of flooding." The 55th Civil Engineer Squadron is working closely with the Army Corps of Engineers, the state of Nebraska and the city of Bellevue to discuss potential flooding issues, the release states. "More than 20,000 sandbags have been ordered and will be filled by base personnel to distribute throughout the base for the protection of facilities and resource," the release states. I don't usually give out stellar marks, but hey! We arrived at sunset and were met by the camp host. She carted me down to the office to pay and carted me back. She was as gracious and helpful as could be. We hooked up and relaxed for the night. Fantastic stay! 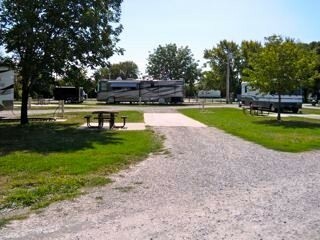 Very nice campground located on a 113 acre lake. Campground is not on base. We had a long level concrete pull thru site that had a patio and picnic table. No wi-fi or cable but we picked up 25-30 OTA channels with our antenna. Campstore has snacks, drinks, fishing supplies and lake and bike rentals. Very quiet and well maintained. "Due to Security Reasons (? ), no rigs will be left unattended for any length of time without prior authorization from [the] Base Lake Operations Manager or Famcamp Host." You have to get permission to leave your rig all locked up and unattended if you want to go anywhere...??? As stated in other posts. I29 to Hwy34 is the best access, all 4 lane roads. Camp hosts and MWR employees all friendly. Nice overall campground and fair stay policy, rest of AF needs to look at their policy and incorporate most if not all the rules. Recommend making reservations, was 3/4 full when we arrived and weather was still cold. They do become full on a lot of weekends. So reserve to make sure you get a spot. Sewer and water are at back of site so need extra hose to connect. I needed 20 or 30 feet(closer to 30, maybe 25) of sewer hose to reach sewer, same for water. Electric was fairly close. Level concrete pads, pull thru's are better for big rigs if available. Enjoyed our two night stay. Will stay again. We stayed here for three nights and had a very enjoyable experience. The camp hosts (husband and wife) were extraordinarily helpful and made our stay trouble free. The park is centered in the base recreation area with a large lake. It is peaceful and well maintained. Instead of taking hwy 370 paying a toll for the bridge and going through town, it's easier to take hwy 34 and go north on Harland Lewis Rd. FamCamp is on the right not far after the railroad crossing. The city streets are narrow and not fun to navigate a larger fifth wheel, my wife was medicated due to a head cold so I didn't get yelled at, lol. The spot we had required a 50' water hose and almost a 50' sewer hose. You can get a garden hose on base but not sewer hose, but Camping World is only 25 miles away. Stayed here in Sept 17 in a Motor Home. 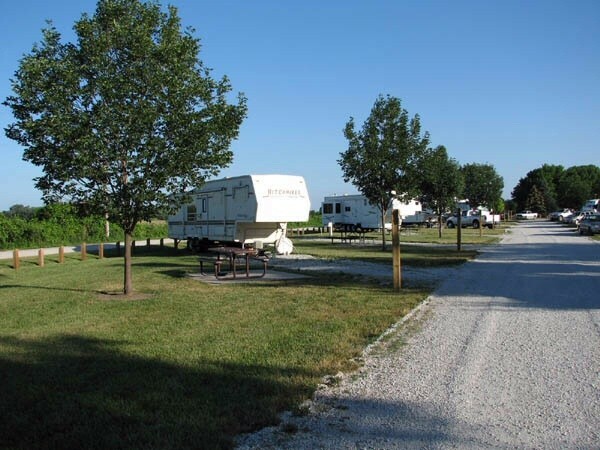 Great campground with paved sites, utilities can be a ways from the parking spot (longer sewer hose might be required) grassy sites near the base lake. Easy access from the south off US 34. Generally quiet (its an air force base, you know) with a playground for kids. Plenty of room to walk the dogs. Great value and reservations are accepted 30 days out for us retired folks. I'd recommend this for any type RV. Nice, clean camp. The 2 individual baths, were a walk from any site, were nice and clean. Friendly staff. GPS may miss lead you. The camp is located by a lake off base. Great Famcamp. 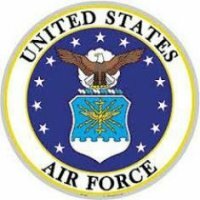 I'm a new Full Timer, retired AF, and was stationed here back in the mid 80s. The base lake was nice then, and it is nice now. People are catching fish, spots are spotless and mowed. Great water pressure. Camp Host Sam and her husband (Vietnam Vet) keep it going. They did have a tornado come through in June, and they lost a lot of huge trees. Flipped over one popup and minor damage to a 5th wheel, but no one was hurt. BTW: mailing address to get mail sent here is: YOUR NAME 105 Airman Circle Suite 99999 Offutt AFB NE 68113 That is the Postal Service Center on Base. They said you don't need to put GENERAL DELIVERY. They are open M-F 8-5 and Sat 8ish - Noon. I will be back! Three night stay and was very enjoyable. The Camp host, "Sam", was very friendly and made sure our stay was pleasant. Check-in was quick and painless, but the day we checked in the office was closed so we had to come back in the next day to pay. 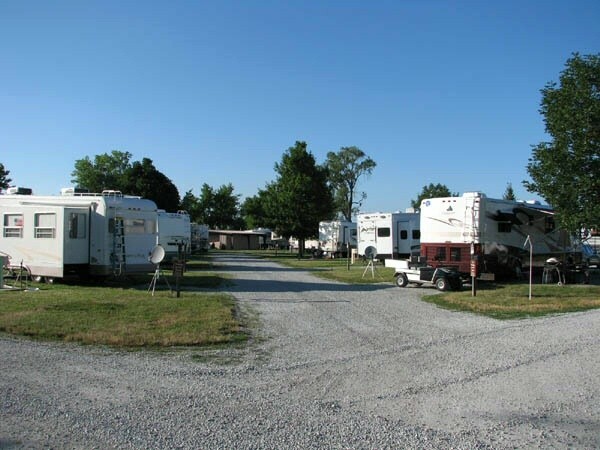 The campground was meticulously maintained. They had received a couple of inches of rain before we arrived and she drove me around in a golf cart to find a dry site and one satellite visibility. The office is well-stocked and there is a wide variety of check-out and rental items for the kids. The lake is beautiful and very clear. Security Forces presence was appreciated. Wish each spot had a fire pit. The lake is crystal clear. And it's nice to see the security police drive by often. We enjoyed our visit. We only stayed one night during our through travels, but we loved it. Maybe next time we'll stay a lot longer. The staff is awesome--very helpful and accommodating. Thanks so MUCH! I believe this is the best Fam Camp the Air Force has west of the Mississippi River. It is very well kept and clean. It is located outside the base, but just a short drive to the commissary and exchange. Very relaxing stop over, because the hook up were easy to find and will kept with a friendly helping staff. We stayed here for a week in a pull-thru site and really enjoyed our stay. The sites are large and easy to get in and out. 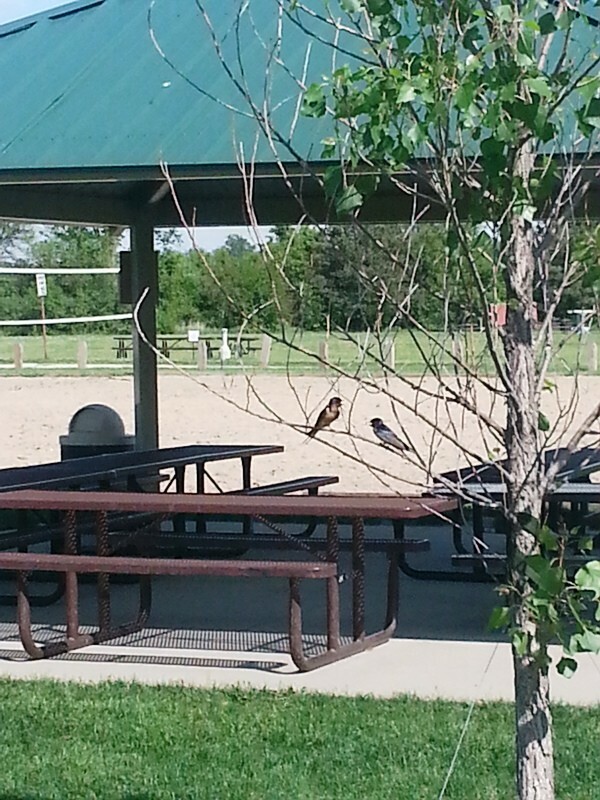 Nice picnic tables at each site, well maintained grounds, friendly camp host and Office staff. Great Fam Camp to stay at. Our only issue was that we couldn't set up our satellite for southern exposure because of trees, and there isnt a dog park to our dogs play & run off leash. We will definitely stay here again and highly recommend it. Good Job Offutt!! Spent one night on our way across country and was surprised when we pulled in and discovered all the water spigots open. They decided to turn the water off and didn't tell us when we made reservations a month earlier. Luckily we had a full fresh water tank. One of our neighbors told us about the bathrooms in the boathouse building and gave us the combination to get in. We never saw a camp host, but there was someone at the boathouse, when we went in the next morning, who directed us to the tank-fill spigot in between spaces 3 & 4 next to the horse shoe pits. Sites had nice concrete pads with gravel approach and departures and had plenty of room around them for slides, awnings, and such. WiFi was good, with no password required and had 2 or 3 bars depending on which antenna you used. Showers were inserts into older stalls, so they were very small for my 6' plus frame. Bathrooms were dated, but very clean with plenty of hot water and good pressure. We stayed here to visit the SAC Air & Space Museum, (which is about an hour away past Gretna), so we didn't use any other amenities. Aircraft and trains were heard but never disturbed us - your sensitivity may vary. We'll stay here again, but hopefully the water will still be on! Nice park. Real nice. Employees at the Boathouse were very friendly. Pull thru site was long enough for my 41' fifthwheel and longbed truck. Good water pressure, o.k. Wi-Fi. Park is off base, so no gates to contend with. Quiet location. The occasional "sound of freedom" was not a nuisance. Would definitely stay here again if in the area.